Two teams of muscular tattooed, bare-chested men are engaged in hand-to-hand combat over a ball, though with all the bodies flying, it's often impossible to say where it is. A thousand spectators sit in the bleachers set up around the square, yelling with rapacious glee. The melee is intermittently obscured by thick, red smoke, generated for the occasion by a machine, creating the illusion that all present - including old Dante - are peering into the fiery depths of hell. The rest of the article can be accessed here. Sounds like a fascinating read and I am very much looking forward to getting my hands on it. In their February 2008 issue, T&L features the Palazzo Antinori, a Renaissance palace located in Florence which has served as the headquarters for the Marchesi Antinori winery since the 16th century. Inside the palazzo are two restaurants, the upscale Cantinetta Antinori and the unpretentious Buca Lapi. Cantinetta serves elaborate regional dishes while Buca Lapi reputedly offers up the best steak in Florence. Given that the palazzo is located on Via Tornabuoni close to Prada, Versace and Armani, I would suggest you eat and imbibe after you shop, or you may find your wine-lessened inhibitions leave you with a substantially lightened wallet. 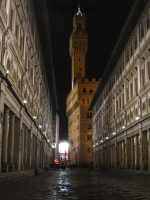 If you are planning a trip to Florence, already live there or are contemplating a move, a great web destination for you is the blog Florence Journal. This eclectic site features everything from interesting places to visit in and around Florence to the restaurants they frequent and wines they drink to the books they're reading on Italy. This is definitely a blog worth putting on your subscription list. I just came across an interesting new online store selling unique and handcrafted Tuscan products located at www.florenceinabox.com. Nothing in the store is mass-produced. Rather, each piece is hand made often using techniques and tools that were invented hundreds of years ago. Everything they sell ships directly from the artist's studio or workshop to your home. The product categories include ceramics, glass works, wood, metal art, clothing and accessories, paper and book binding and silver. Though the selection is not very broad yet, there are nevertheless many beautiful and unique items that would make wonderful gifts. It's definitely worth a browse.